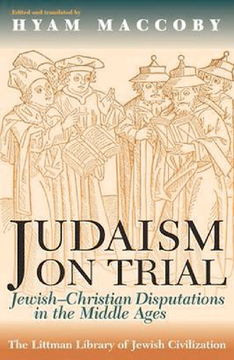 Hyam Maccoby's now classic study focuses on the major Jewish—Christian disputations of medieval Europe: those of Paris (1240), Barcelona (1263), and Tortosa (1413–14). It examines the content of these theological confrontations with a sense of present-day relevance, while also discussing the use made of scriptural proof-texts. Part I provides a general thematic consideration of the three disputations and their social and historical background. Part II is a complete translation of the account of the Barcelona Disputation written by Nahmanides, one of the greatest figures in the history of Jewish learning, and was Jewish spokesman at the disputation. Part III contains Jewish and Christian accounts of the Paris and Tortosa disputations. A new introduction reviews the relevant literature that has been published since the original edition appeared. The late Hyam Maccoby was Emeritus Fellow of the Leo Baeck College, London, and Visiting Professor of Jewish Studies at the University of Leeds from 1998 until his death. He published many books and articles on rabbinic literature, Jewish—Christian relations, Christian origins, and the origins of antisemitism. Among his writings are Revolution in Judaea (1980), The Sacred Executioner (1982), The Mythmaker (1986, second edition 1998), Early Rabbinic Writings (1988), Judas Iscariot and the Myth of Jewish Evil (1992), awarded the Wingate Prize, A Pariah People: The Anthropology of Antisemitism (1996), and Ritual and Morality: The Ritual Purity System and its Place in Judaism (1999).